An illustrated storybook by Dr Qasim Afridi and Maeve Clancy. 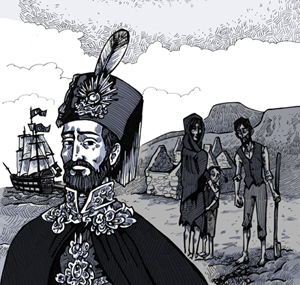 Unknown Sultan and the Great Hunger of Ireland. This historical event is unknown to most people in Ireland and the Muslim world. Since history books are silent about this event, the authors felt a need to tell this story in an entertaining yet educating format. The Unknown Sultan is also about reminding the Muslim world about their most important obligation to have a single political leadership for the Ummah. We present to our readers this illustrated storybook featuring the artwork of Maeve Clancy. It took us a lot of thinking to develop this short story book from concept to final creation. We hope you will enjoy reading it as much as we enjoyed creating it.